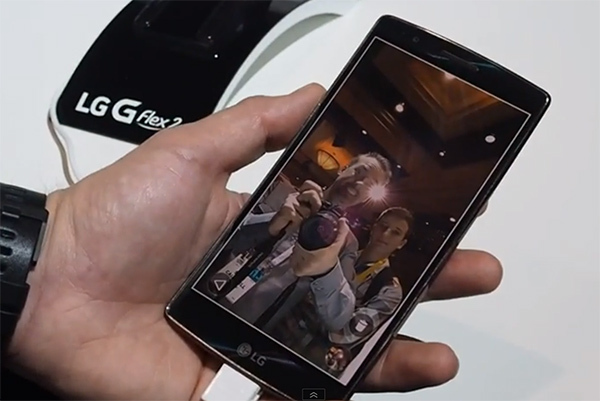 No that’s not a banana in your pocket it’s the new banana shaped LG G Flex 2. We aren’t certain what the South Korean companies fixation with curvy smartphones is, but this time they seemed to have nailed it. After Monday morning’s LG press conference we got to spend some time with Ethan that showed off some of the handsets more prominent features, like it’s wildly curvy design. The phone comes in at 5.5 inches and it’s curved from top to bottom. Yes this new LG G Flex 2 is all about that bass, no treble, but we aren’t talking about any special audio accoutrements we’re talking about those wild and crazy curves. But alas it’s not about what’s on the outside it’s what’s on the inside and in the case of the LG G Flex 2 we’re talking about a 2ghz Qualcomm Snap Dragon processor 810, 2GB of RAM, 16 or 32gb of storage, a 3000 mAh battery a 2.1MP front facing camera and a 13mp rear facing camera with laser focus. As Ethan shows us in the video below it’s also packed with some cool features like gesture controlled selfie camera. Simply frame up the perfect selfie, ball your hand up in a fist and voila, no more awkward shaking your hand around your phone trying to find that software button for the selfie magic. The LG G Flex 2 also features customizable icons that can be made from nearly any picture or graphic as well as a really cool notification screen at the top of the phone that only brightens up the notification window, very reminiscent of the ticker in the Samsung Contium phone a few years back.